It is often the last thing you think about when writing a resume, but the file format you select for your resume is extremely important. If you send your resume in a format that is impossible or simply difficult for the employer to open, he or she may toss out your application. According to employer surveys, 99 percent of employers want a .doc (a Microsoft Word file) or a PDF file of your resume. However, there are many factors to consider when selecting your resume format. The file format an employer wants may vary based on the company's applicant tracking system (ATS). For example, some tracking systems are not compatible with PDF files. The employer may also ask for a particular format depending on how you are submitting your resume—posting it online or emailing. For emailed applications, employers may be concerned about viruses, which are often found in email attachments. On the job ad, employers may specify that any emailed documents be PDFs, which are virus-free. Some employers may request that you copy your resume copy directly into the body of your email, avoiding attachments entirely. It's very important to follow the instructions in the job posting. Don't send a different file format or your resume may not be viewable and may not even be reviewed. Should You Use .doc or .docx in Microsoft Word? Be careful about saving your resume as a .docx file, which is the default in the latest versions of Microsoft Word since 2007. While .docx is becoming more and more common, not all applicant tracking systems can read them, and your resume may come out garbled. Instead, save your resume as a .doc file. While nearly every company either has Microsoft Word or access to Google Docs, which makes opening a .doc or .docx file easy, there are some significant advantages to saving your resume as a PDF. Microsoft Word and other word processing programs often place squiggly lines under misspelled words or grammatical errors. But many of these "mistakes" are not errors at all when it comes to resumes. A lot of jargon words or company names, for instance, may not be in the word processing program's dictionary, but that does not mean they are spelled incorrectly. 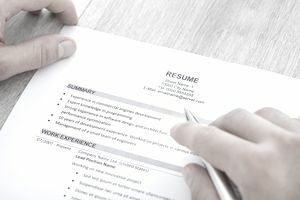 By saving your resume as a PDF, those squiggly lines, which could be distracting to hiring managers viewing a document on the screen, will not show up. Plus, while both Macs and PCs can run Microsoft Word, documents often appear differently when opened on a Mac than when opened on a PC. It's possible that some of your careful formattings will not show up correctly if hiring managers use a different operating system. That's not the case with PDF documents. If you are sending a resume directly to a contact or hiring manager through email, a PDF is often your best option. For resumes submitted through an application system, follow the directions specified. To save a document as a PDF, go to File > Save As in Microsoft Word. In the box that opens up, select PDF from the Format drop-down menu. To save a Google Doc as a PDF, go to File > Download As and choose PDF Document. The goal is to make it as easy as possible for the employer to open your resume and learn about your qualifications. Therefore, follow directions carefully, and keep your format and resume title as straightforward as possible.